금강반야바라밀경은 줄여서 ‘금강경’이라고 부르기도 하는데, 모든 법이 실체가 없으므로 집착하는 마음을 일으키지 말라는 공(空)사상을 중심사상으로 하고 있다. 우리나라에서는 조계종의 근본경전으로 반야심경 다음으로 많이 읽히는 경전이다. 이 책은 양나라 부대사(傅大士), 당나라 혜능(慧能), 송나라 종경(宗鏡), 천노(川老)의 금강경에 대한 5가지 해석을 모아서 편집한 것으로『금강경오가해』라고 부른다. 태종 5년(1415)에 성거가 글씨를 쓰고, 해혜와 조구가 시주하여 간행한 것이다. 나무에 새겨서 닥종이에 찍었으며, 상·하 2권이 하나의 책으로 묶여져 있는데, 상권의 첫째 장과 책 끝의 몇 장이 떨어져 나갔다. 크기는 세로 26.5㎝, 가로 16.5㎝이다. 일반적으로『금강경오가해』에는 조선 전기의 고승 기화(己和)가 중요한 내용을 풀이한 설의(設誼)가 붙어 있는 것이 전래되고 있었다. 그런데 이 책에는 설의가 없고 책 끝에 결의(決疑)만 붙어 있는 것으로 보아 기화의 설의는 이후에 저술된 것으로 보인다. Vajracchedika prajnaparamita Sutra (Diamond Sutra) is the basic sutra of the Jogye Order and is one of the most widely read sutras in Korea along with Maha prajnaparamita hridaya Sutra (Heart Sutra). 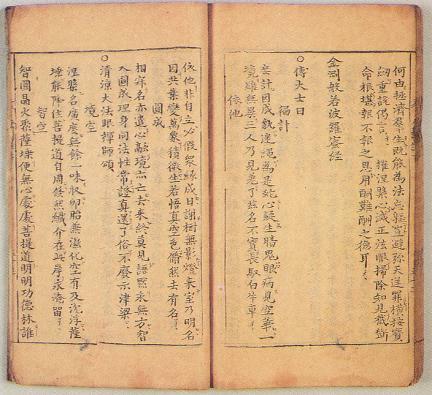 Also known as Geumganggyeong ogahae (Five Commentaries on the Diamond Sutra), this book was compiled by collecting the five commentaries on the sutra written by Fu Dashi of the Liang Dynasty, Huineng of the Tang Dynasty, and Zongjing and Chuanlao of the Song Dynasty. 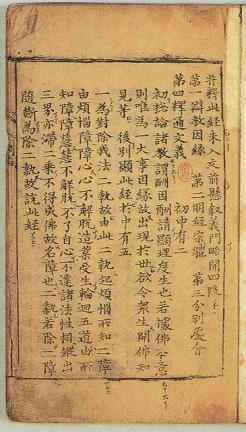 It was transcribed by Buddhist monk Seonggeo and published in 1415 (fifth year of the reign of King Taejong of the Joseon Dynasty) with a donation from Haehye and Jogu. This book was printed on mulberry paper using woodblocks, with the two volumes bound into one book. The first page and a couple of pages at the end of the first volume are now gone; the book measures 16.5 cm wide and 26.5 cm long. 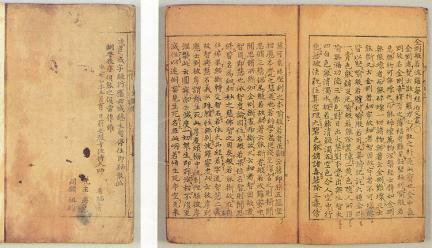 In general, Geumganggyeong ogahae contains an annotation by Gihwa, an eminent monk of the early Joseon Period. Note, however, that this book includes only a signature at the end of the book, suggesting that Gihwa’s annotation was written later.